My crowdfunding project has been running for 3 weeks now with 2 weeks to go. It is on the Irish crowdfunding website FundIt which operates an ‘all or nothing’ principle which means that if a person’s target is not achieved, he/she gets nothing. I wrote about my thoughts after the first week here. 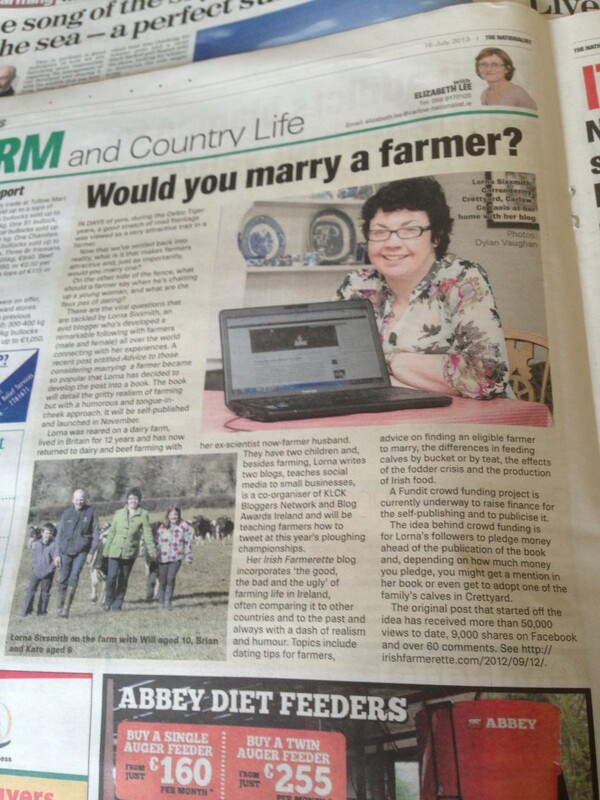 The project is for a self published book ‘Would You Marry A Farmer?’ Confessions of an Irish Farmerette’ which was inspired by one of my most popular blog posts. My target is €6,000 (which I’m now thinking might be too optimistic but time will tell) and I’ve achieved 32% at €1950 with 69 pledgers. I calculated last week that I will need approximately 200 pledgers in total to reach my goal of €6,000, hence it needs another 130 funders. As expected, the pre-orders for the books are the most popular rewards, many of the funders are from Ireland or the UK and that reward for a hardcopy of the book is €15. Some have pledged for the €25 (copy to be posted outside of Europe) and for the €45 reward (2 copies posted and acknowledgments/links). There have been a few people booking the social media course and the €100 option for 5 books. Where Are The Pledges Coming From? In hindsight, I should have told more people before the crowdfunding project went live. Friends need to be informed, they need to be aware of your passion, how much the project means to you so they are ready to support you by either pledging or sharing or both. I launched it and then told people. As is normal, people will put it on the long finger too when they get the notification but it is important that you get some support and pledges in early. Apparently more strangers will support once it reaches 20 or 30% and I certainly found that to be the case once it reached 15%. It is still early days so it will be interesting to see if this continues. Fundit is much smaller than some other crowdfunding websites which means it won’t have the same number of regular visitors or philanthropic pledgers that a crowdfunding site such as Kickstarter or Indiegogo might. However, the advantages are that there isn’t as much competition for those pledges and it is easier for your project to be profiled on the home page. There are 8 anonymous pledgers for the project of whom I know the names of three – three friends who chose to remain anonymous. I have no idea who the other 5 are and won’t find out until the project is successful. Of the 61 known funders so far, 17 (28%) of them are from twitter. What I mean by that is I have never met them and only know them via twitter. They are people I’ve chatted to in tweetchats or about farming and it was especially wonderful to see their names pop up and know that they want to read my book. 9 (15%) are totally unknown to me so I don’t know whether they saw it on facebook or twitter or on my blog. 30 (almost 50%) are known to me in that they have been friends for a long time or have become friends through social media, business or networking. 4 came via the blog or facebook and one came from a post on another blog. I think social media, particularly twitter, is going to be the most influential tool in this campaign. 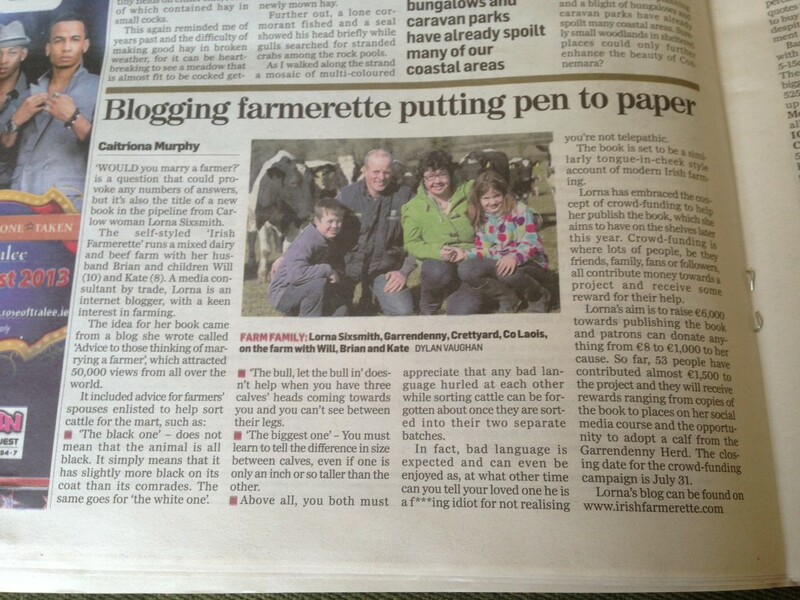 I have achieved some PR in that it has been featured on Agriland, Irish Central and the popular blog Got Ireland. The lovely farming blogger, Donna of Midlife Farm Wife, who hails from Illinois, also featured it on her blog. I also included it as a story on WorldIrish. It was featured in the local newspaper The Carlow People last week, the Carlow Nationalist this week and yesterday’s Farming supplement in the Irish Independent. However, looking at the stats on my blog and the pledges that have come in since, only one or two have come from the PR so far. The difficulty with hardcopy PR is that people then have to go online, find the website, find your project and then make the payment – much easier if it is a link from an online source. I was expecting more success with the online features but it’s still very much early days. I just received a tweet from someone saying she had heard from others that they loved the extracts in the hard copy newspapers so it will be interesting to see what happens. However, this is why I think social media is going to be the most influential tool as it allows you to build up relationships through conversation – not a conversation whereby you are thinking about getting them to make a pledge but a conversation where you genuinely have interests in common. It’s hard to ask people to pledge but just asking them to share just doesn’t result in pledges. It’s a difficult thing to do when you don’t know their financial situations but are aware things are tight for many people. I wasn’t necessarily expecting to get coverage from the press releases I sent out (and I didn’t send them to many journalists). One journalist rang me as she reads my blog. PR gives your project more credibility and gives you a boost – time will tell whether it boost pledges. What I do think it will achieve is more sales when the book is launched, particularly as I now have the contacts for the journalists. It is hard to get pledges from strangers and I think that is understandable, particularly for a book. People would be much more inclined to buy when they see the book in front of them and can read reviews – it’s still very much an unknown for them. You need someone behind you to boost your morale when it’s been a very quiet day! Crowdfunding is like another fulltime job! Twitter – I need to become a bit more cheeky (which is hard) and tweet people who would be my target audience and ask them to pledge, then assess the results. Someone said to me to keep the twitter account solely for tweets about the book but because I had the account for 2 years and it hasn’t been set up specifically for the project, I’m uncomfortable doing that and continue to tweet as I normally would but with book focused tweets incorporated. Facebook – A number of friends are sharing it on facebook (without me asking) so it remains to be seen if that will result in actual pledges. I’ve asked some friends on facebook (and via email) to support. I know human nature is to put it on the long finger so time will tell on that one. Regarding the business page, I’m doing at least one update a day about the project, even if it is just saying how it is going and I’m also putting up extra updates about the farm etc. Linked In – I have almost 500 connections on LinkedIn (although some of these will overlap with facebook friends) and although I have changed my job description, I really haven’t connected with people there and asked them to support. That is on the to-do list! Blog – the blog post that started it all is still getting reasonable traffic every day – average of 300 a day and it contains links to the Fundit campaign. Maybe some of the unknown pledgers have come to it, I don’t know. I’m also putting up an occasional post which contains part of a chapter in the book – sort of like a ‘sneak peek’. Press Releases – I need to work out what other American-Irish online publications I should target with press releases and think of another angle for a press release at the weekend. It’s surprising how long these things take! Perhaps a new angle will be exploring how social media, particularly twitter, has been effective in the campaign – if it continues as such. With 14 days to go and 67% to achieve, it feels like there is still plenty of work to be done. However, if you say it quickly, 150 pledgers doesn’t sound that impossible – does it?! If you would like to be one of the 150 and pre-order a book or perhaps pre-pay for one of our social media courses at We Teach Social and a book, I’d be delighted. We now have the Advanced Pinterest Course up as well as the Beginners again, a Business Blogging Course and starting next Monday is a Social Media course for Charities and community groups. If you would like to pledge, you can do so here on Fundit. It’s on my to do list! Just need to login and make the account etc, keep those reminders coming!! Pingback: Book Review & Competition: Would You Marry a Farmer?